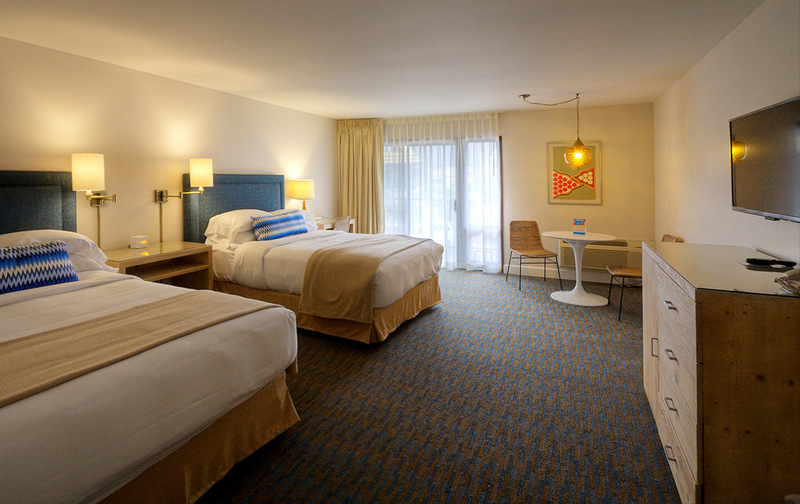 Make yourself at home in an expansive, newly renovated guest room with one king-size bed and fun retro-modern furnishings. Many of our king rooms also include private balconies with poolviews or views of our beautifully landscaped 14 acres. Experience home comforts and enjoy great amenities in a uniquely designed, retro-inspired guestroom featuring custom-designed furniture pieces made on the U.S. west coast out of reclaimed barnwood. Each room is appointed with a collectible globe pendant swag lamp and a mod, white tulip table from the 1970s. Artwork from that same era produced by a Parisian graphic artist hangs in the hallways and rooms. 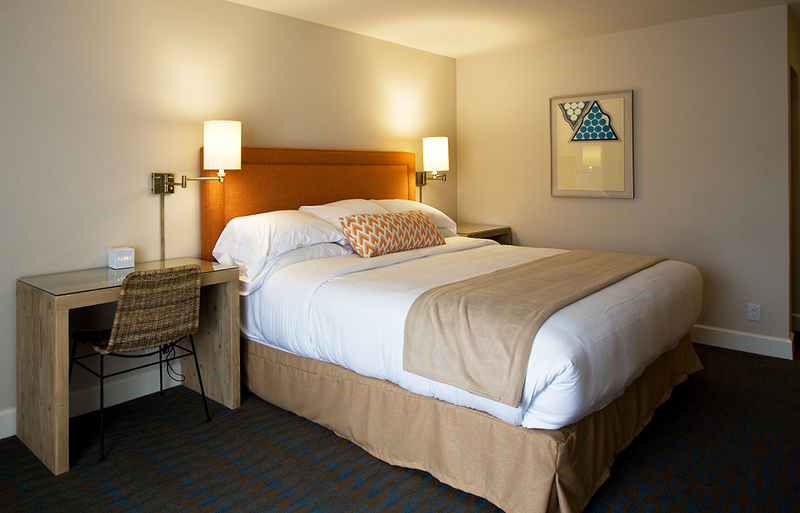 High-quality, extra comfy beds are outfitted with custom-made, tangerine orange upholstered headboards, luxurious linens, and all the pillows you could want. Your room includes complimentary Wi-Fi, in-room coffee, a flat screen TV with digital cable and HBO, a mini refrigerator, and much more. All guests receive a free continental breakfast served on our second floor mezzanine, located just up the stairs from the hotel lobby. 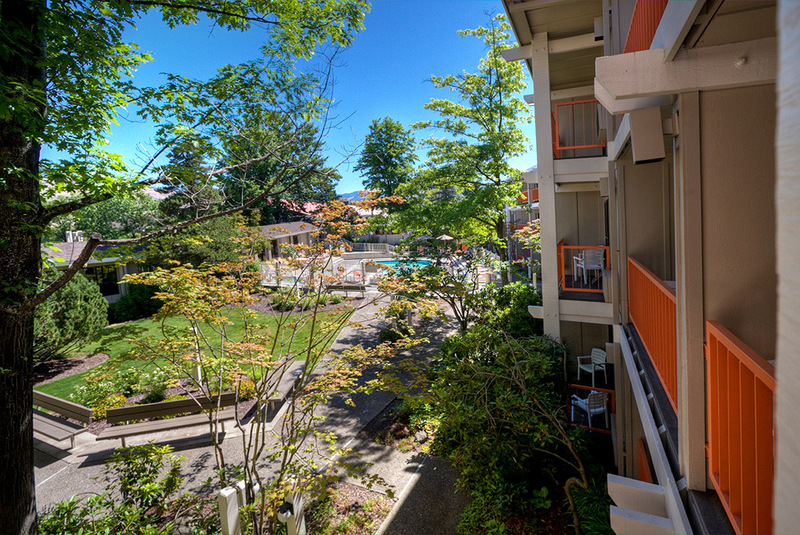 Other amenities include our seasonal outdoor pool, year-round hot tub, fitness center, tennis courts, business center, guest laundry, and even bicycles for guest use. Book your single king room now. 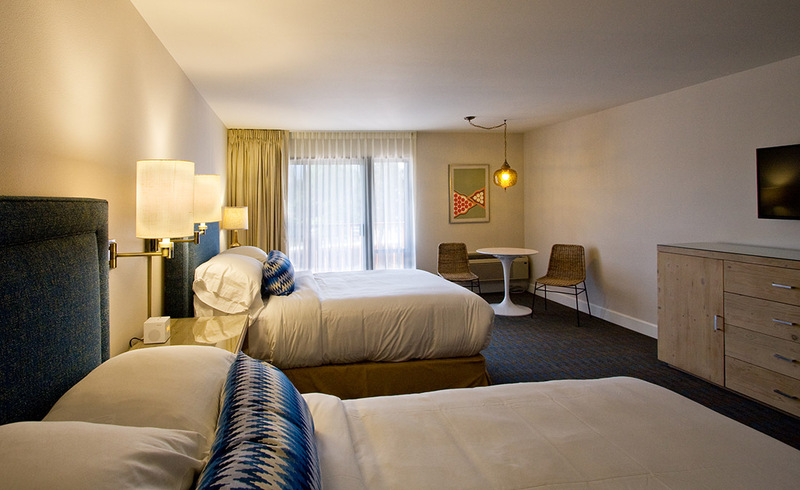 Enjoy your rest and relaxation with a wonderfully renovated and spacious guest room featuring two queen beds, comfortable furnishings, and our signature retro-modern décor. 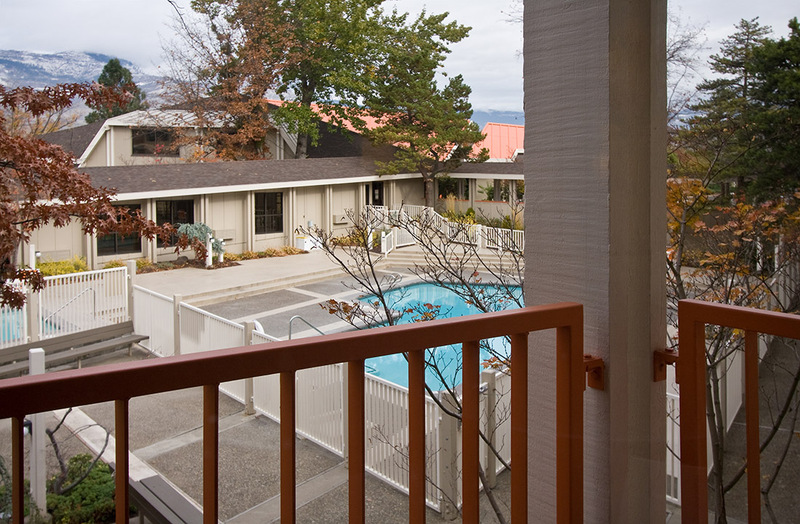 Many of our rooms also have private balconies with fantastic views of the Ashland Hills and our natural surroundings. This retro-inspired guestroom features custom-designed furniture pieces made on the west coast out of reclaimed barnwood. 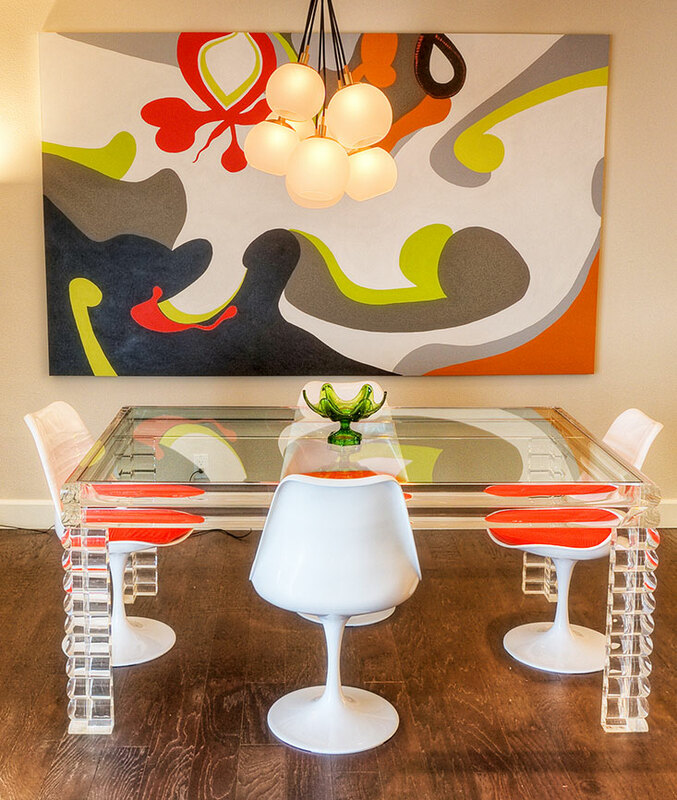 Each room is appointed with a collectible globe pendant swag lamp and a mod, white tulip table from the 1970s. Artwork from that same era produced by a Parisian graphic artist hangs in the hallways and rooms. High-quality, extra comfy beds are outfitted with custom-made, galaxy blue upholstered headboards, luxurious linens, and all the pillows you could want. 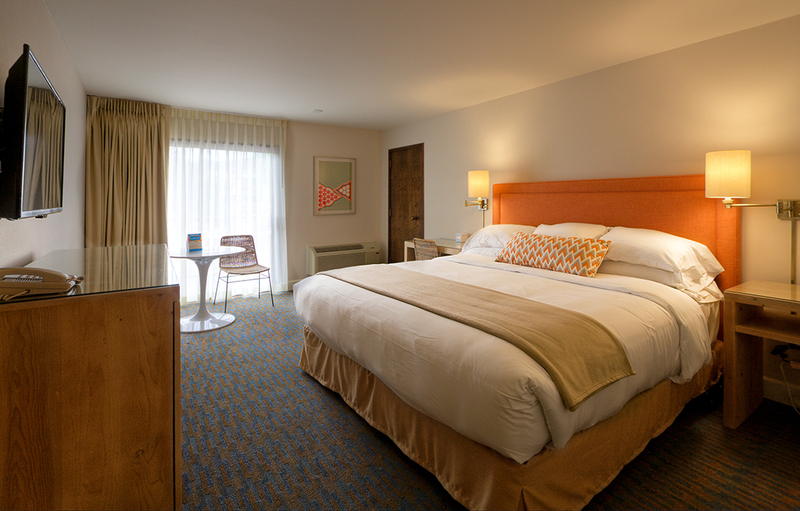 Enjoy a comfortable room and great amenities along with our uniquely inspired, retro-modern design. Book your stay now. 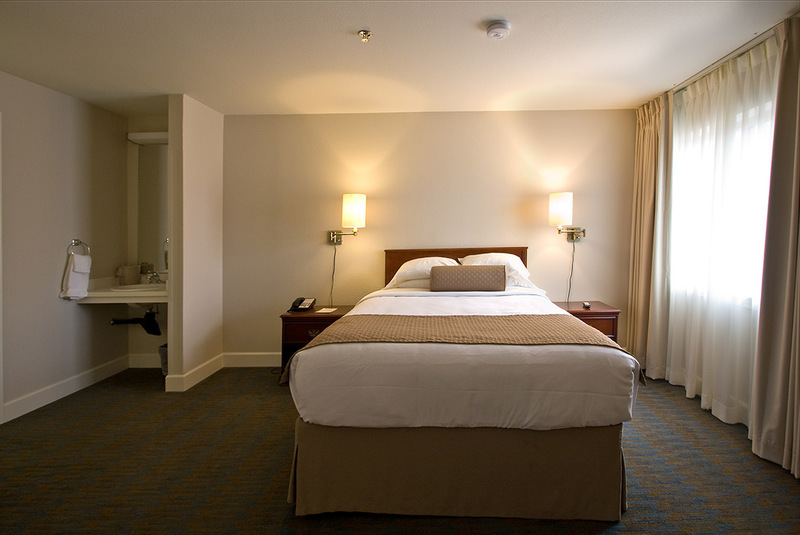 Give yourself room to dream in a newly renovated “classic” king suite offering a private bedroom with a king bed made up in fine linens so comfy you’ll feel like you’re sleeping on a cloud. Your bedroom is connected by French doors to a separate sitting room which includes wonderful cushy carpeting and a small kitchen space. 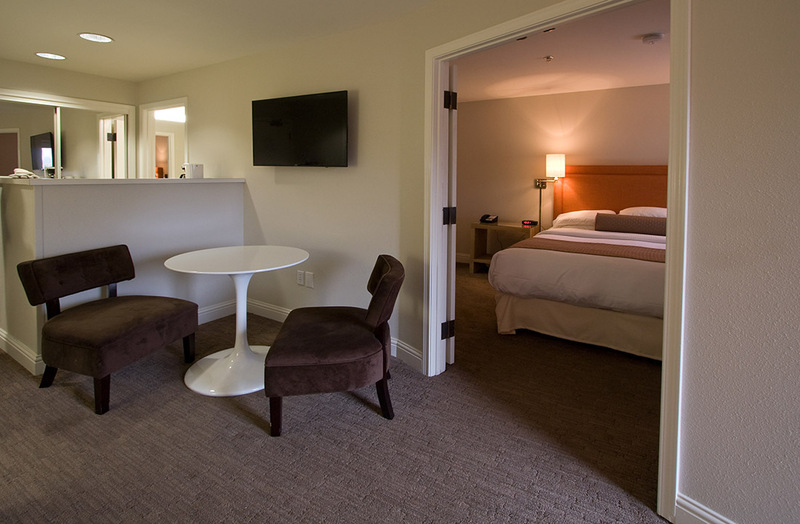 Many suites offer private balconies to enjoy the magnificent views of the Ashland Hills and surrounding landscape. Your suite includes a complimentary continental breakfast served on our second floor mezzanine located just up the stairs from the hotel lobby. 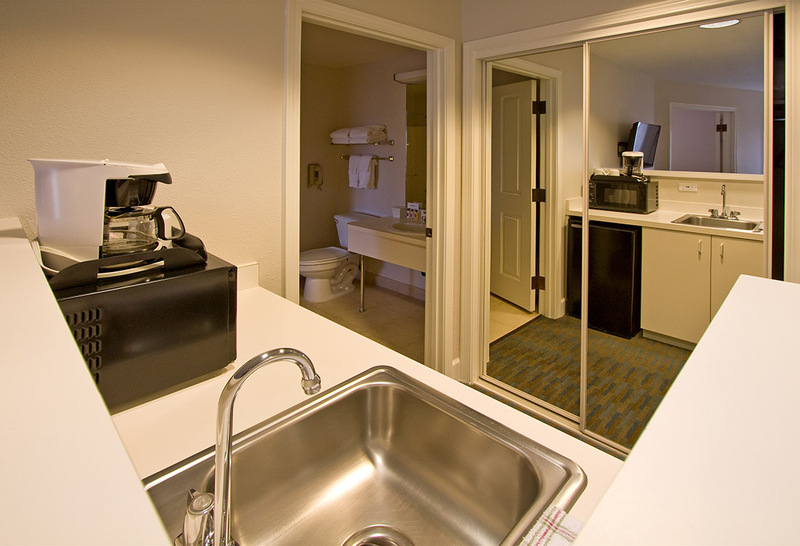 Suites are also equipped with complimentary Wi-Fi, a coffee maker, microwave, mini refrigerator, voice mail, and guest-programmable wake-up calls. 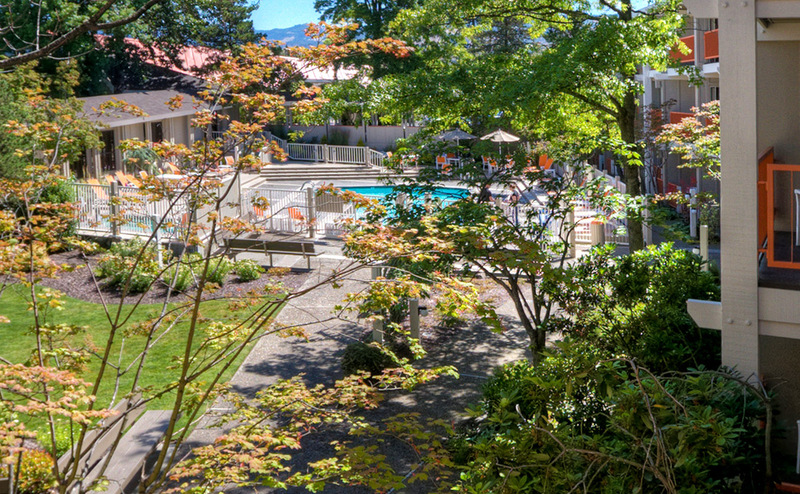 Additional amenities include our seasonal outdoor pool, year-round hot tub, fitness center, tennis courts, business center, guest laundry, and bicycles for guest use. 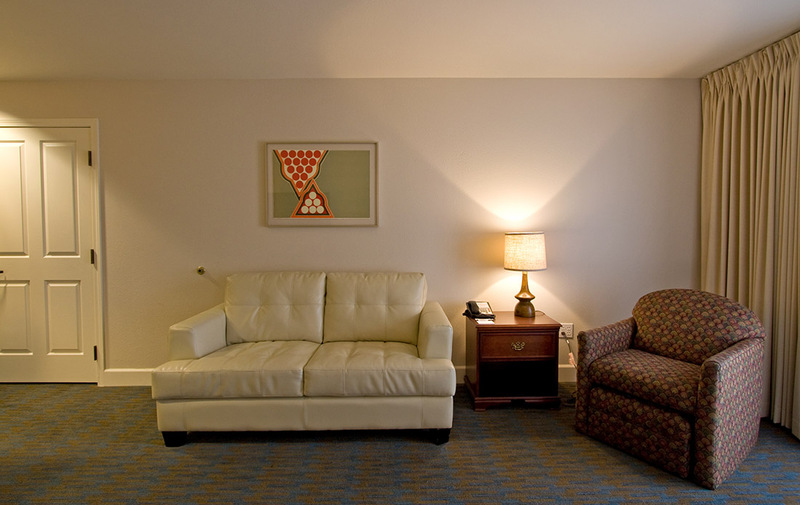 Select suites offer pull-out couches (call for availability and details). 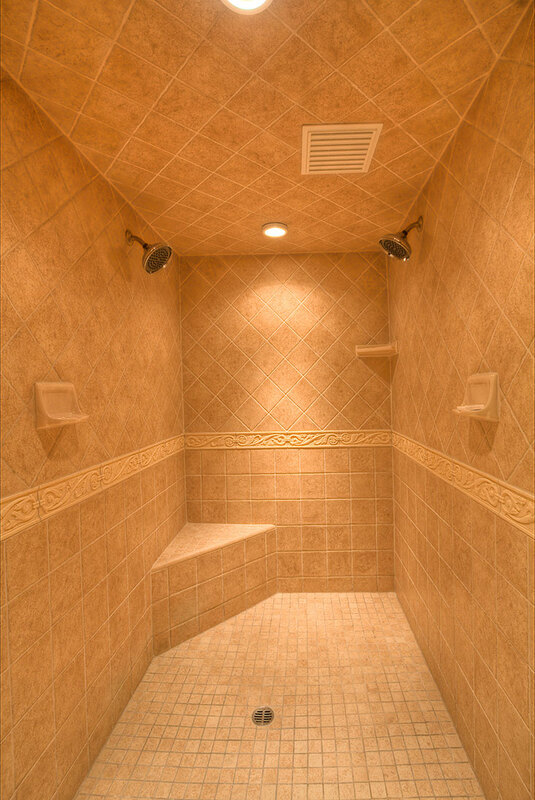 Families and traveling companions can enjoy this expansive, adjoining space with options for privacy. Book your king suite now. Give yourself room to dream in a newly renovated, spacious and accessible queen suite offering a private bedroom with one queen bed connected by French doors to a separate living room. Your living room includes a newly reimagined space with cushy carpeting, a small kitchen space, and a bed with fine linens so comfy you’ll feel like you’re sleeping on a cloud. 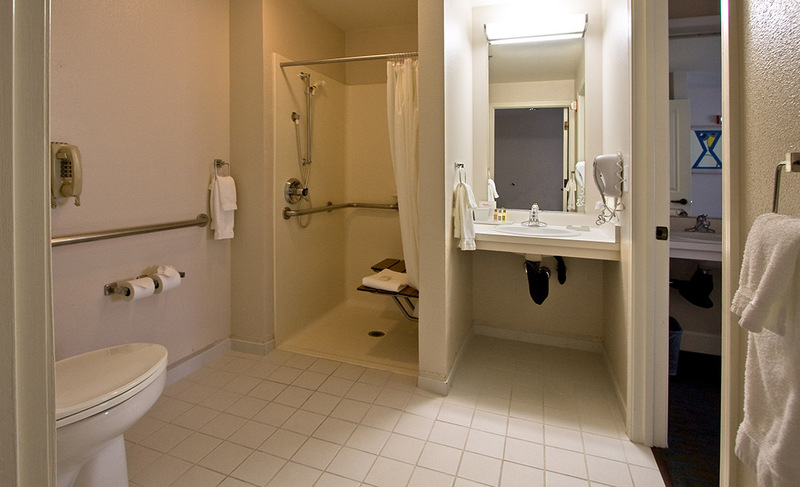 The bathrooms in these suites feature a roll-in shower. 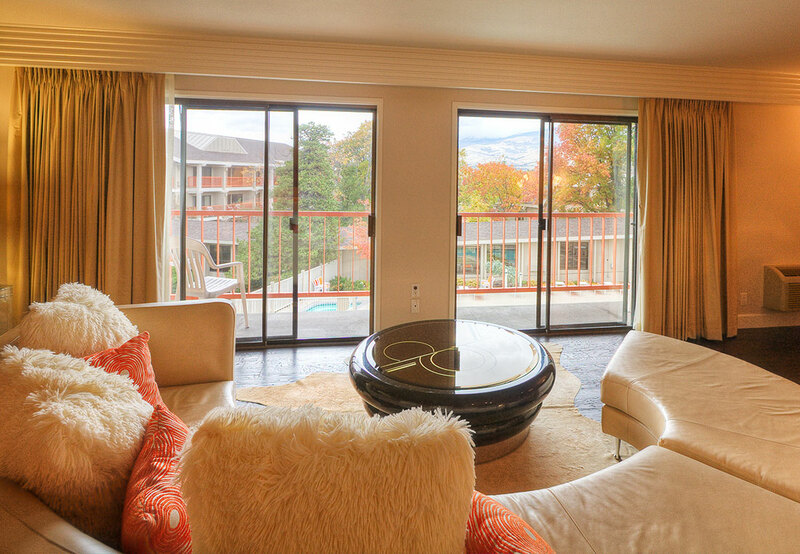 Many suites offer private balconies to enjoy the magnificent views of the Ashland Hills and surrounding landscape. Guests also receive a complimentary continental breakfast served on our second floor mezzanine located up the stairs from the hotel lobby. 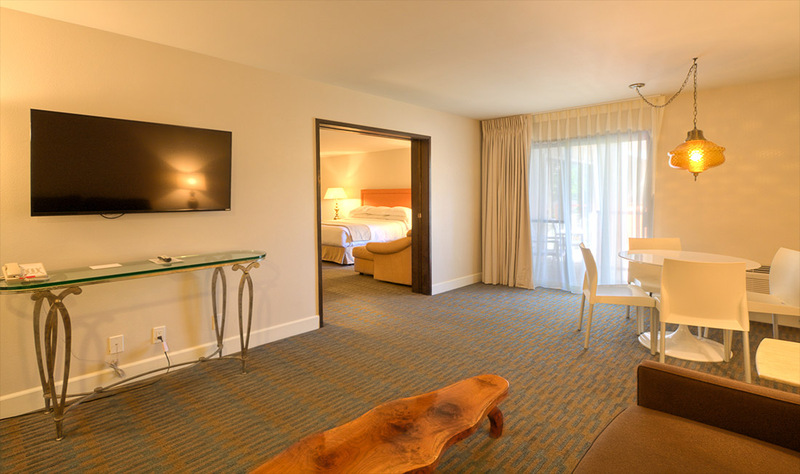 Our beautifully renovated suites are also equipped with complimentary Wi-Fi, a coffee maker, microwave, mini refrigerator, voice mail, and guest-programmable wake-up calls. Enjoy the convenience of accessibility, privacy and spacious accommodations with comfortable furnishings and wonderful amenities. 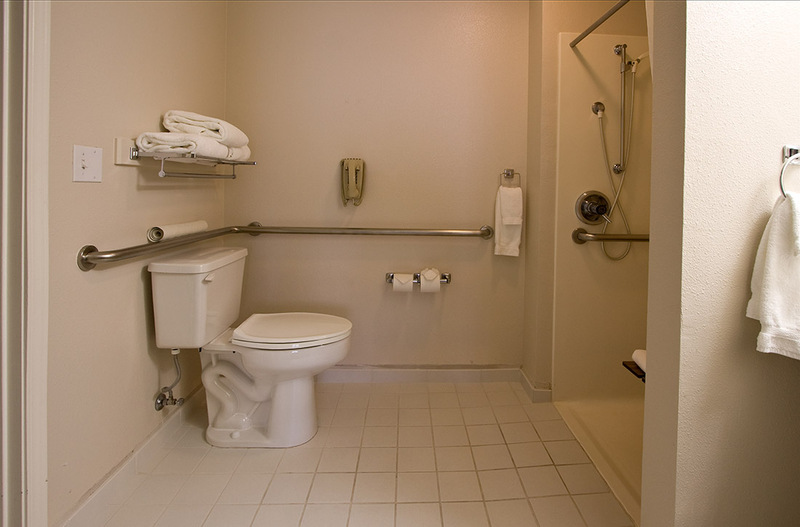 Book your accessible queen suite now. Take advantage of additional space and accommodations with a beautifully furnished double-double suite offering a private bedroom with two double beds connected by French doors to a separate living room. Your living room includes a newly reimagined space with cushy carpeting and a small kitchen space. 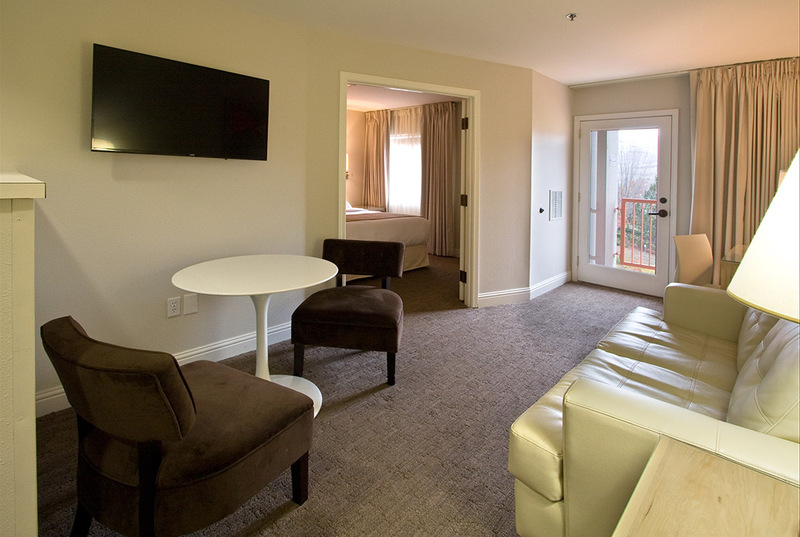 Many suites offer private balconies to enjoy the magnificent views of the Ashland Hills and our natural surroundings. 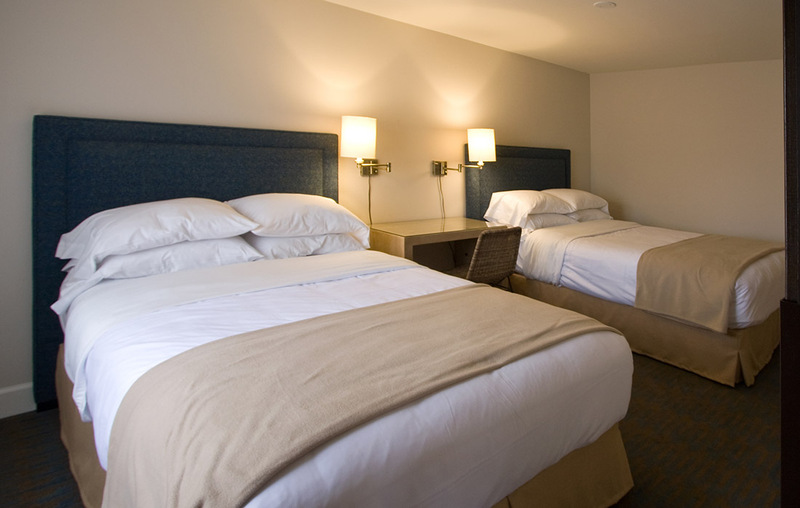 Your double-double suite includes a complimentary continental breakfast served on our second floor mezzanine located just up the stairs from the hotel lobby. Suites are also equipped with fabulous free Wi-Fi, a coffee maker, microwave, mini refrigerator, voice mail, and guest-programmable wake-up calls. 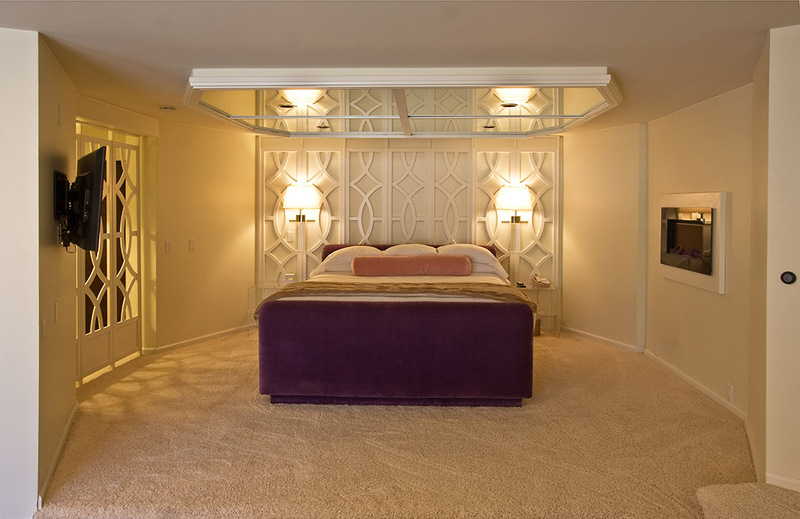 Enjoy home comforts and the convenience of adjoining accommodations done up in retro-modern style. 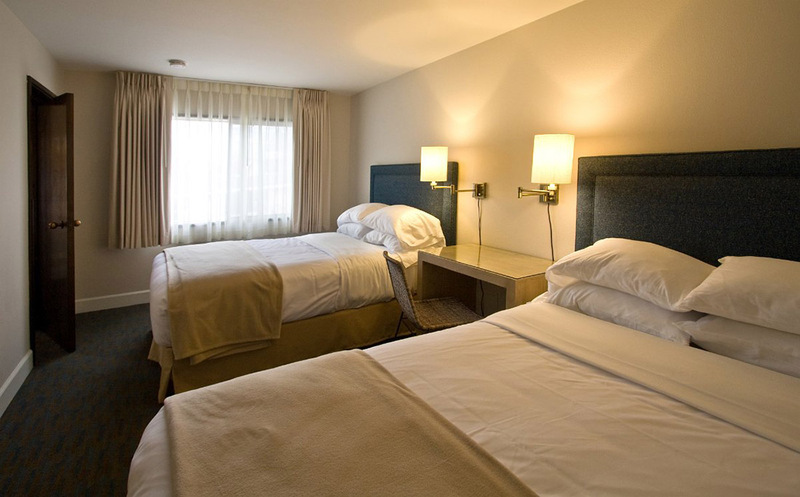 Book your double-double suite now. 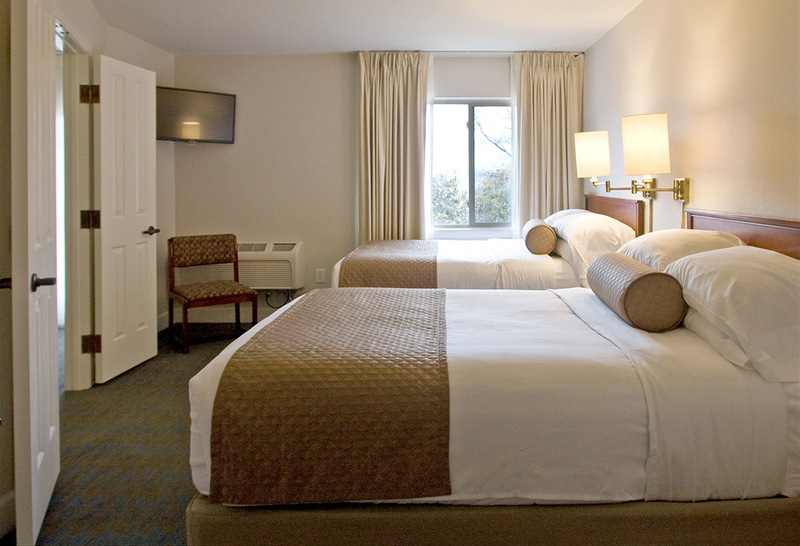 Well-behaved pets are welcome with our pet friendly double-double suite. Pay only a one-time pet fee of $20 per room per stay. Pet accommodations are limited, so please call us to ensure availability. 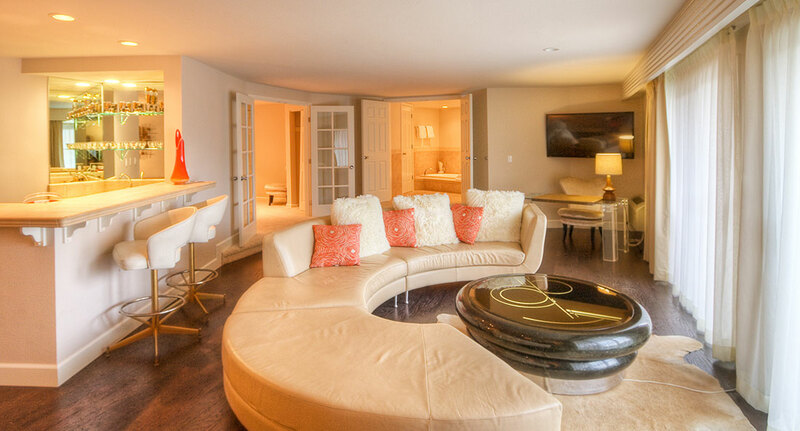 Our pet friendly double-double suites are delightfully renovated in our unique retro-modern style, and each suite features a private bedroom with two double beds connected by French doors to a separate living room. Your living room includes a newly reimagined space with cushy carpeting, a small kitchen space, and a bed with fine linens so comfy you’ll feel like you’re sleeping on a cloud. Many suites offer private balconies to enjoy the magnificent views of the Ashland Hills and surrounding landscape. Complimentary continental breakfast is included and served on our second floor mezzanine located just up the stairs from the hotel lobby. You can even enjoy your meal in our pet friendly area outside the front of our property. Suites are also equipped with free Wi-Fi, a coffee maker, microwave, mini refrigerator, voice mail, and guest-programmable wake-up calls. Pet friendly and pet approved! Bring your furry friends and family and enjoy the comforts of home along with the convenience of spacious accommodations and an affordable one-time pet fee. 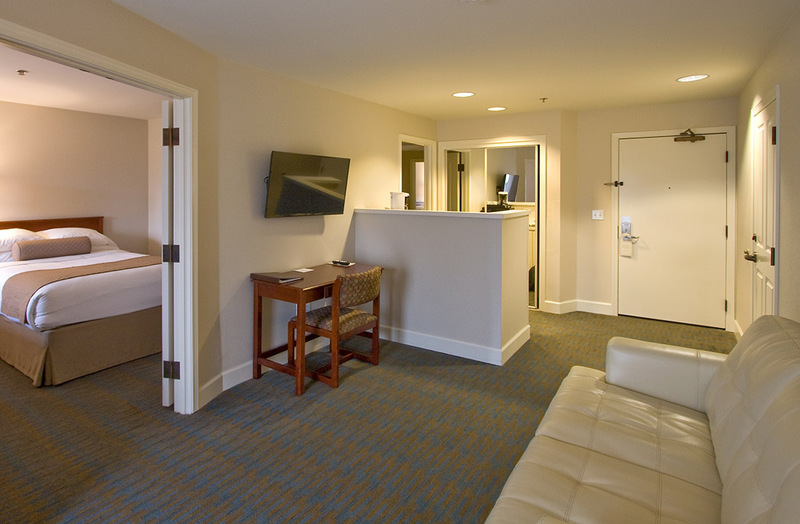 Call us now at 541.482.8310 to check availability and book your suite. 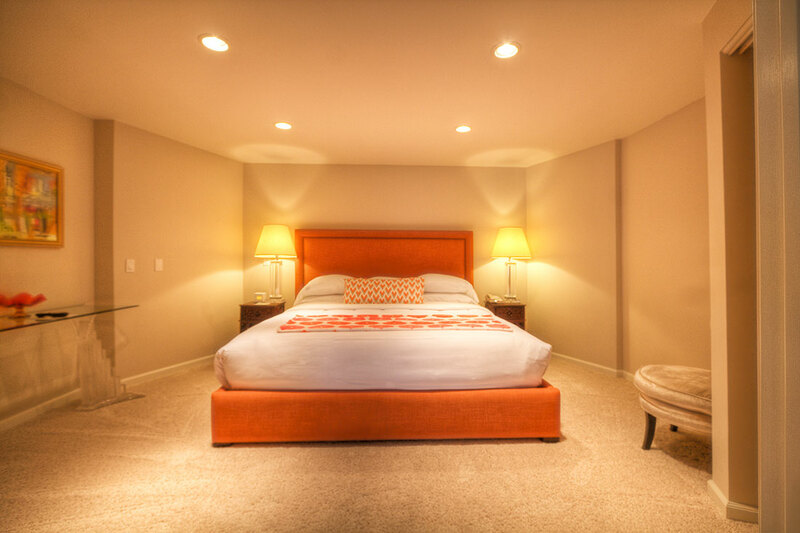 This roomy suite features spacious and newly renovated accommodations offering a private bedroom with one king bed connected by French doors to a separate living room. Your living room includes a newly reimagined space with cushy carpeting, a small kitchen space, and a bed with fine linens so comfy you’ll feel like you’re sleeping on a cloud. We charge only a one-time pet fee of $20 per room per stay. But availability is limited, so call us to make your arrangement. Many suites also offer private balconies to enjoy the magnificent views of the Ashland Hills and surrounding landscape. Complimentary continental breakfast is included and served in our mezzanine room located just up the stairs from the hotel lobby. You can even enjoy your meal in our pet friendly area outside the front of our property. Give you and your pet the royal treatment for an affordable one-time pet fee. 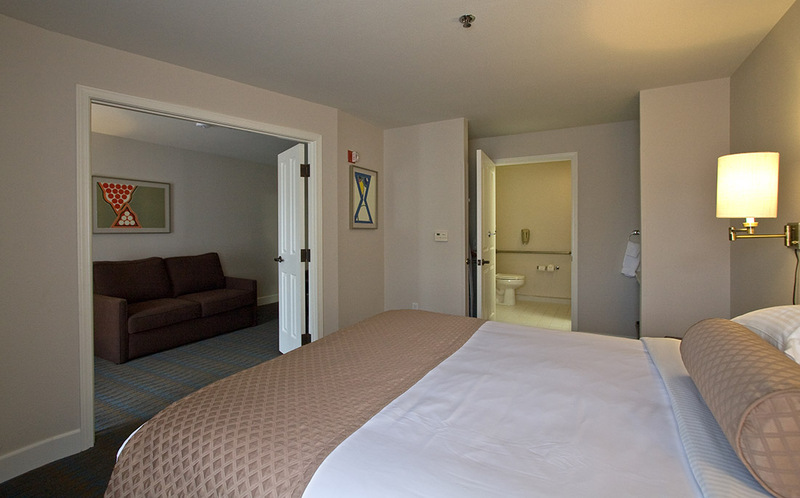 Enjoy expanded privacy, space, and accommodations with comfortable furnishings and wonderful amenities. 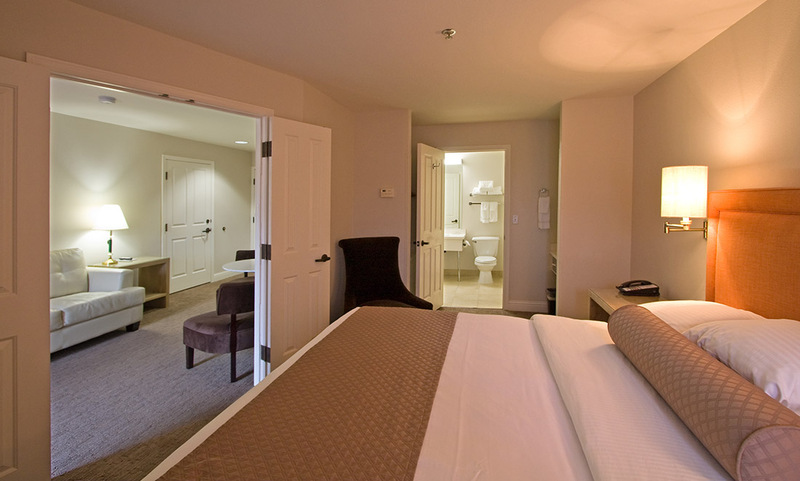 Call us now at 541.482.8310 to book your pet friendly king suite. Cozy up for a romantic getaway or celebrate an anniversary, honeymoon, or other special occasion in our dazzling and spacious champagne suite. This fun, glam suite with swanky attitude showcases a purple velvet platform bed with Lucite sconces, plush shag carpet, a zebra throw-rug and a romantic fireplace. The living room has been furnished with one-of-a-kind pieces hand-picked by our owner/designer including two cream-colored velvet couches, an expandable 1960s brass dining table with smoked glass complete with collectible glassware, and an outrageous triptych of geisha artwork gracing the walls. Two sliding glass doors connect the suite to a balcony overlooking the pool and landscaped courtyard, and the surrounding hills. 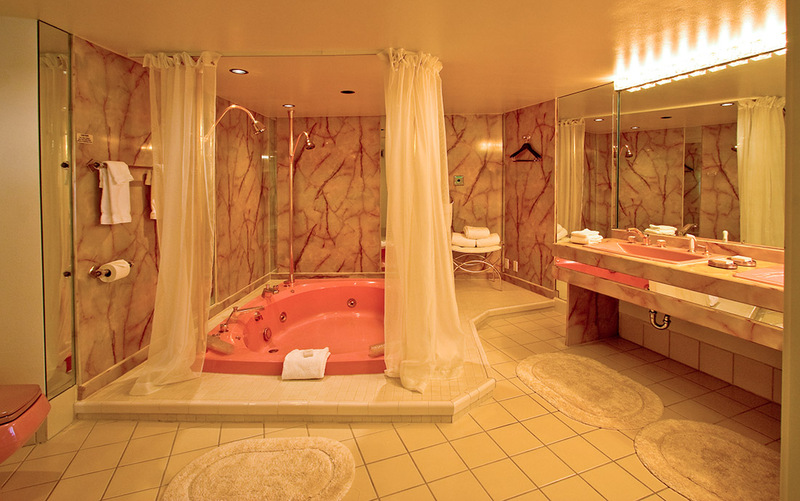 Be inspired by the pink champagne bathroom – an experience of its own – featuring an oversized and sunken jetted tub with dual showerheads, comfy robes, brass accessories, mirrored elements, pink marbled surfaces, dual vanity with original brass vanity lighting, and other delightful surprises. Complimentary continental breakfast is included and served on our second floor mezzanine located just up the stairs from the hotel lobby. 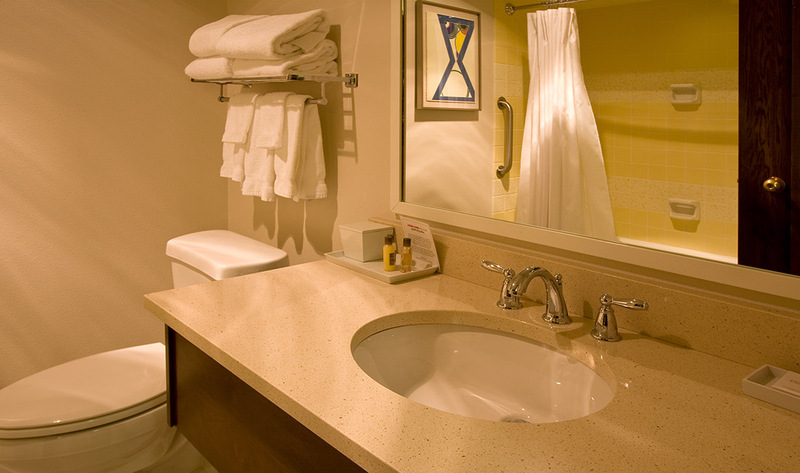 Additional amenities include our seasonal outdoor pool, year-round hot tub, fitness center, tennis courts, business center, guest laundry, and bicycles for guest use. 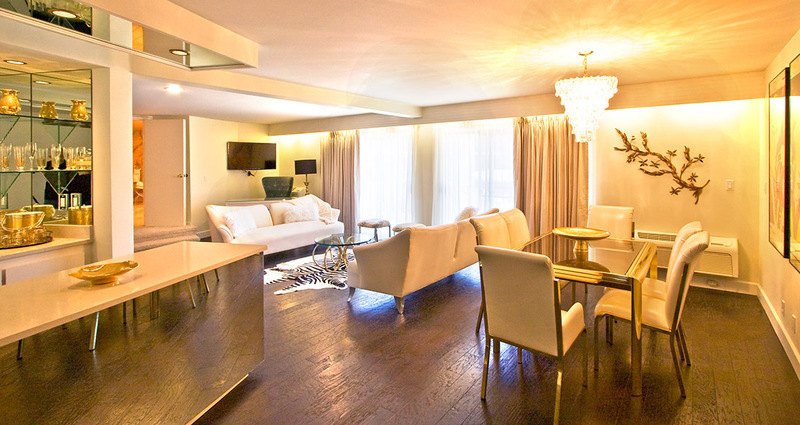 Relax and rejuvenate with a dose of glam in this newly added specialty suite. 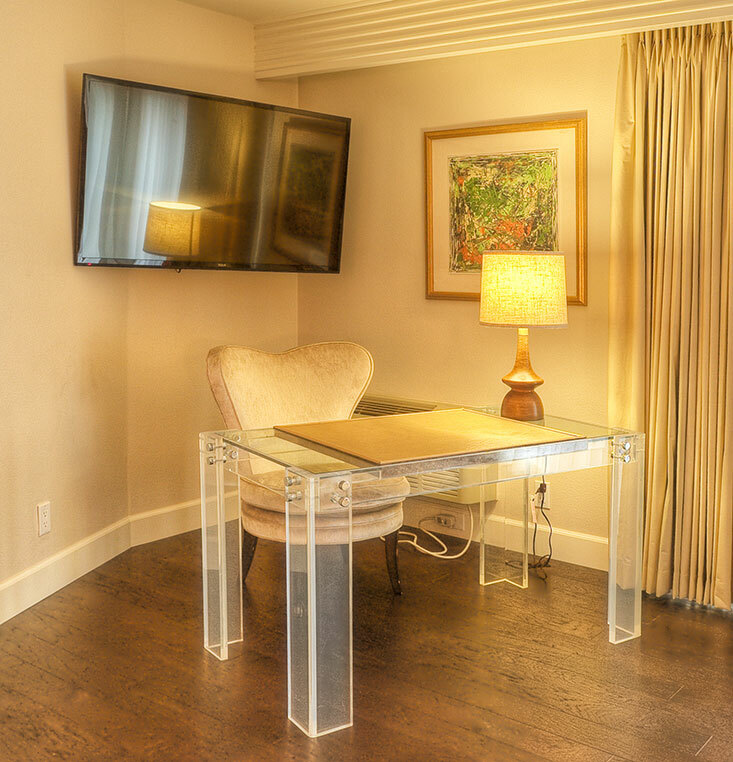 The Manhattan Suite, formerly named the Presidential Suite, is a perfect space for business professionals or a special romantic getaway. Overlooking the pool and garden courtyard with an extended balcony, this refreshingly retro and spacious suite showcases chic and swanky décor. 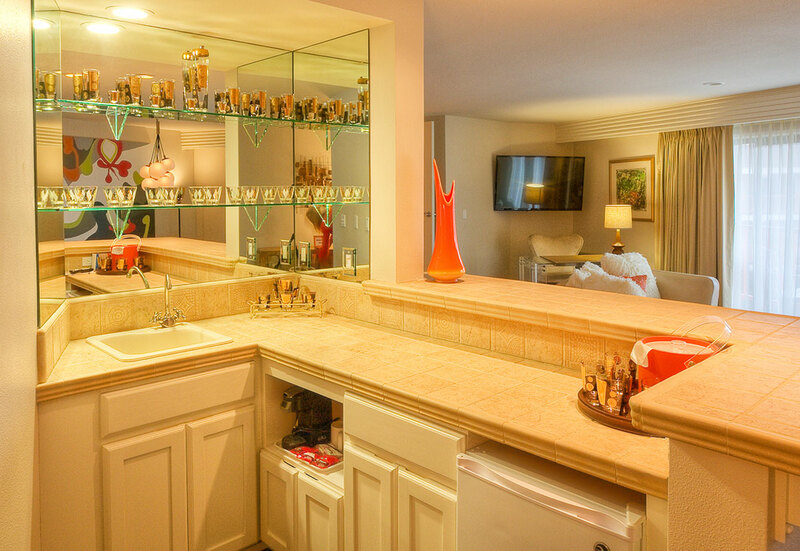 Entertainment area with a wet bar showcasing mirrored shelves with collectible 1970's bar ware and glassware, brass bar stools, mini fridge, sink and coffee maker. 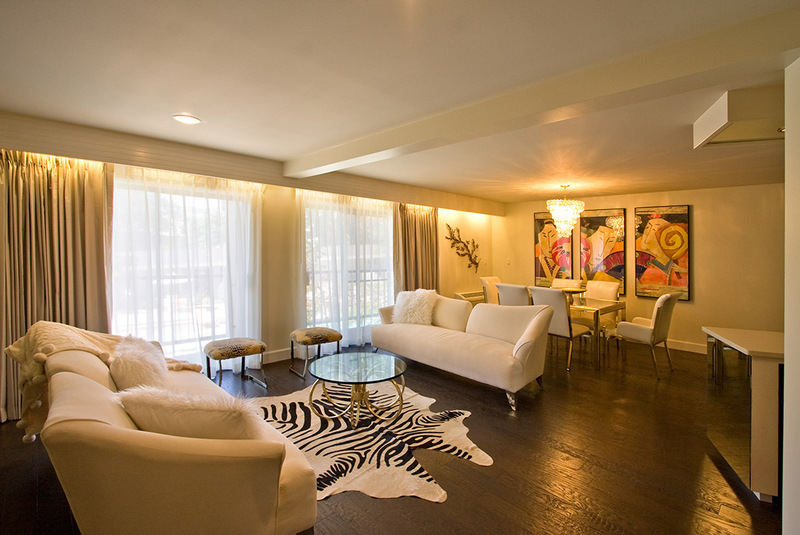 Living area with a circular leather couch, light up coffee table, and Lucite desk and flat screen TV. 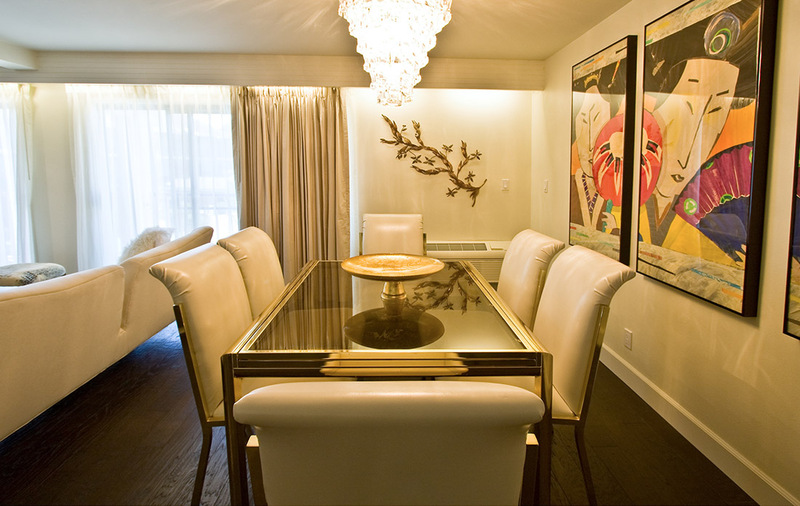 Dining space with a Lucite table with mid-century modern swivel chairs, beautifully lit by a retro globe chandelier. 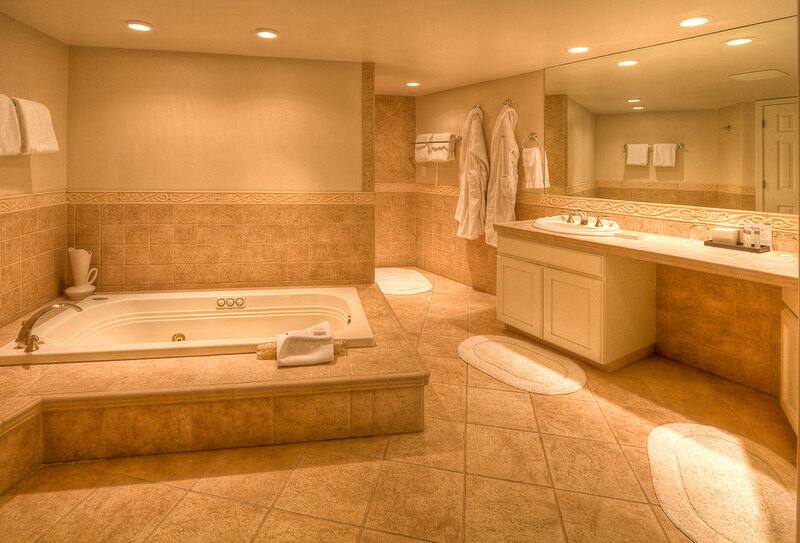 Bathroom with a luxurious jetted tub, comfy robes, dual vanity sinks and a separate shower with dual shower heads. Private master bedroom with a king size bed and flat screen TV. 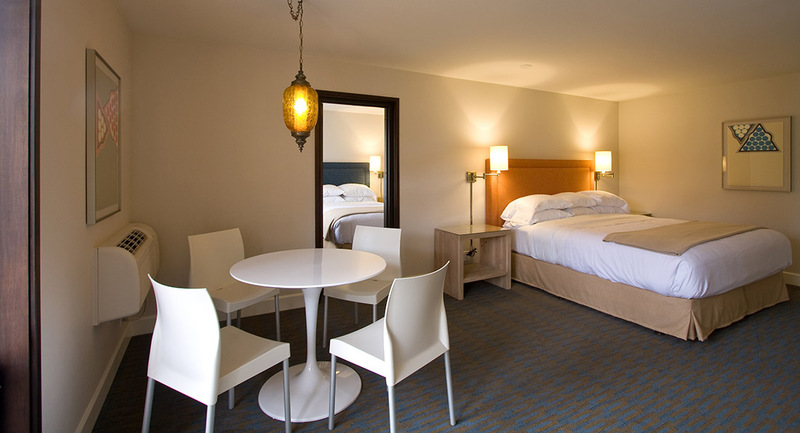 Relax and rejuvenate in comfort and style with a stay in one of our superbly renovated junior suites. Each suite includes either a single king bed or two queens, with a large living area and wet bar separate from the bedroom for extra privacy. Each of our three Junior Suites has a unique design. All pieces have been hand-picked by our designer/owner. 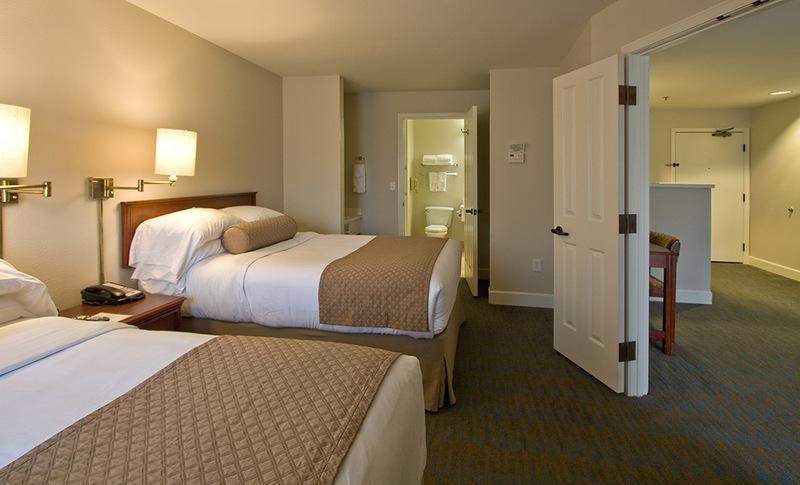 Each junior suite has an adjoining bedroom feature. 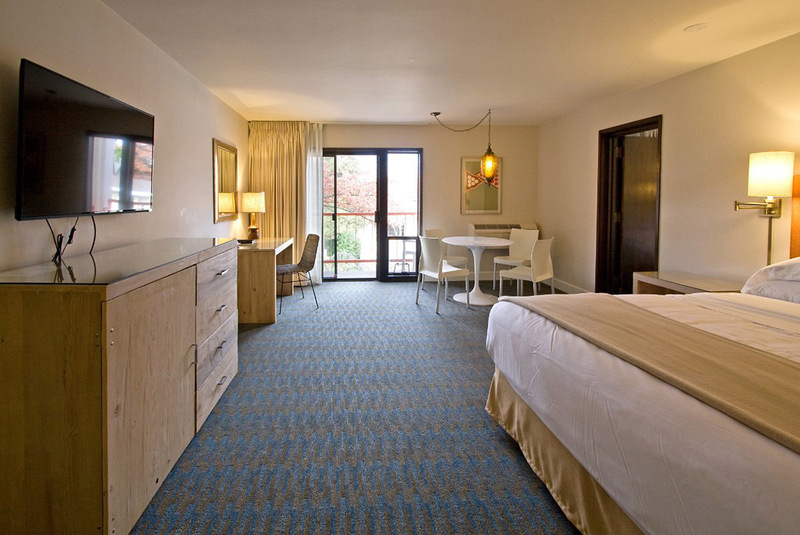 Your retro-modern junior suite will open to either a private balcony or patio. You can enjoy our high-speed Wi-Fi, free continental breakfast served on our second floor mezzanine just up the stairs from the hotel lobby, and a full range of amenities, including coffee maker, microwave, mini refrigerator, flat screen TV with digital cable and HBO. 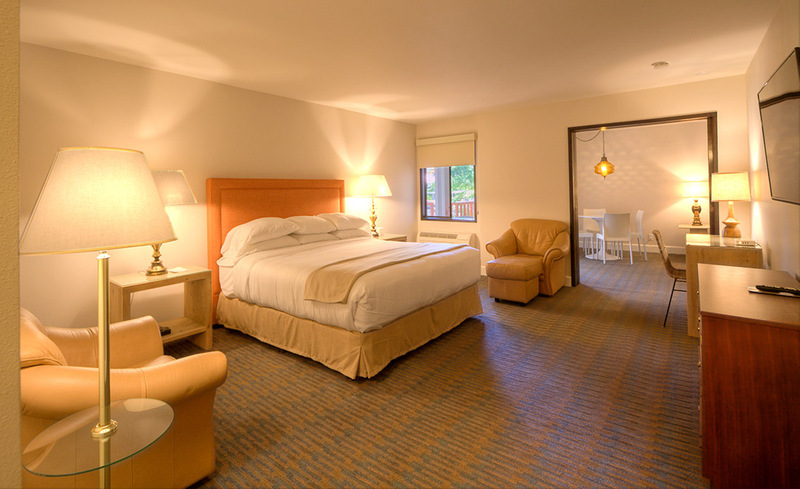 Your stay includes access to our seasonal outdoor pool, year-round hot tub, fitness center, tennis courts, business center, guest laundry, and bicycles for guest use. 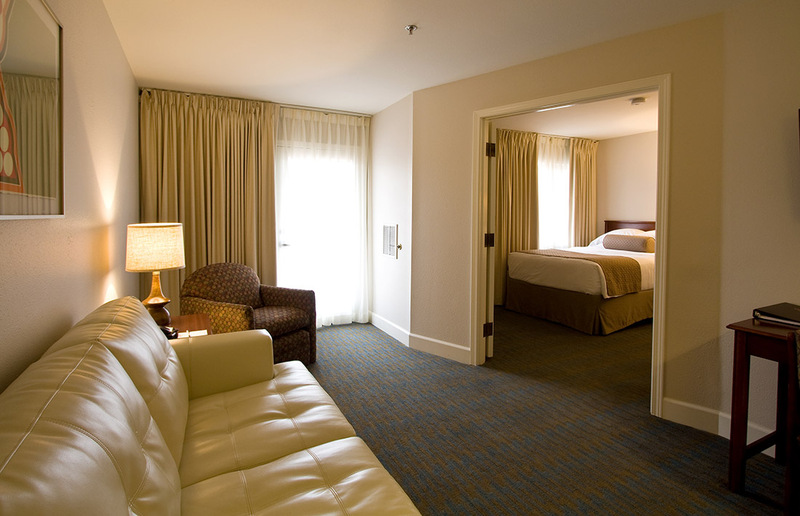 Gather together and enjoy convenient accommodations for everyone with our king duo room for the whole family! These rooms have a unique configuration featuring three beds (two queen and one king,) each of the two rooms with its own TV. Each room includes a mini refrigerator. 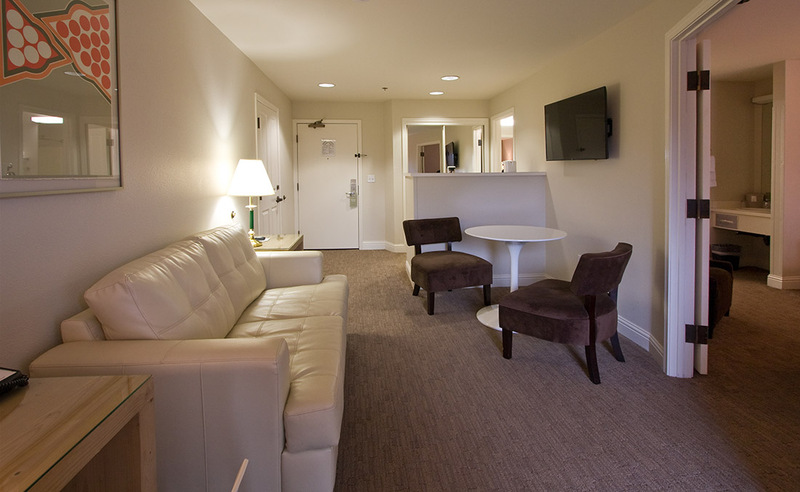 Plus you will enjoy our free high-speed Wi-Fi, complimentary continental breakfast served on our mezzanine, a coffee maker, and two flat screen TVs with digital cable and HBO. 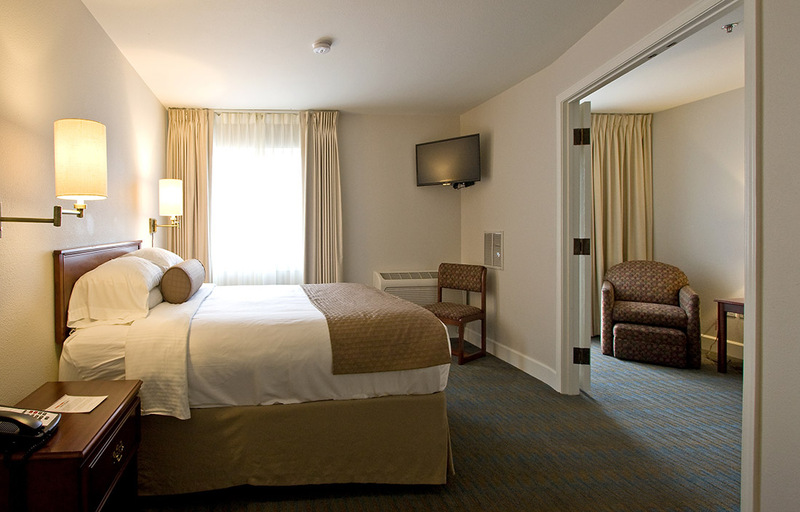 Your stay includes other great amenities, including access to our seasonal outdoor pool, year-round hot tub, fitness center, tennis courts, business center, guest laundry, and bicycles for guest use. 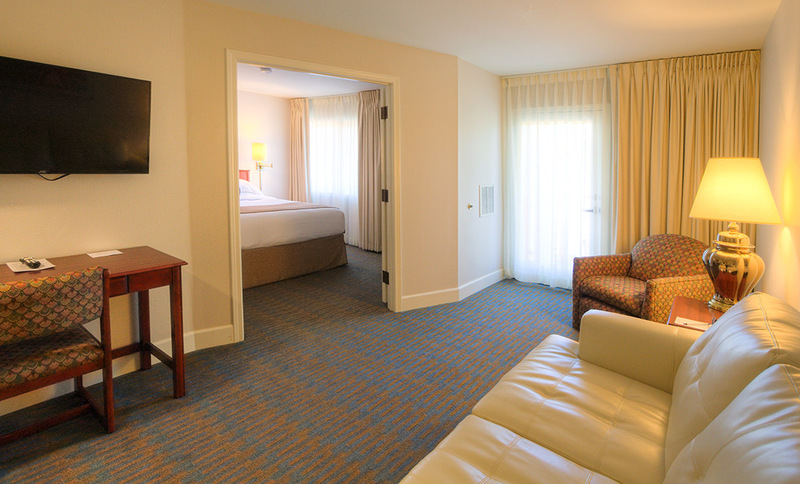 With plenty of flexible space for larger families and groups, our king family duo room is the ideal suite for the whole family***!